Introduction to Operations Research with Student Access Card 9 Edition For over four decades, Introduction to Operations Research by Frederick Hillier has been the classic text on operations research. While building on the classic strengths of the text, the author continues to find new ways to make the text current and relevant to students. One way is by incorporating a wealth of state-of-the-art, user-friendly software and more coverage of business applications than ever before. 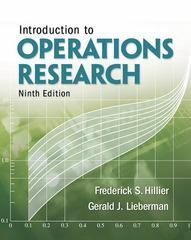 The hallmark features of this edition include clear and comprehensive coverage of fundamentals, an extensive set of interesting problems and cases, and state-of-the-practice operations research software used in conjunction with examples from the text.The ninth edition introduces a new partnership with the Institute for Operations Research and Management (INFORMS). These two pillars of the OR world have come together to showcase some of the award-winning applications of operations research and integrate them with this text.